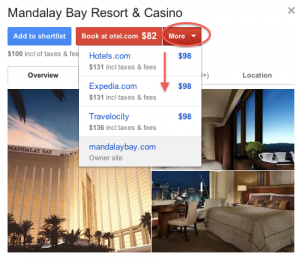 Independent hotels may notice a significant change to their bottom line revenue since Google started beta testing their Promoted Hotels Ad capability earlier this month. We started seeing these ads randomly appear and disappear in the top 1 and 2 spots on certain city searches in early May, but Google has definitely ramped up their frequency within the past week, creating a flurry of articles on the subject. All signs point to Google testing many different algorithms which all include a combination of bid amount and quality score, but “guaranteeing” this top spot is not currently available – just like regular promoted ads on Google, these are magically selected by Google. 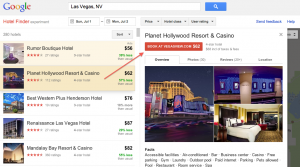 A new “Promoted Hotel Ad” within Google’s Hotel Finder. OTA’s (& hotels) can bid to get this exclusive placement, but only Google knows exactly how its selected. Google claims Bid amount + quality score are some of the factors. Any OTA or Hotel who is currently participating in the Google Hotel Price Ads program is able to put in a default bid and/or raise their bid and Google will select up to 2 hotels within the selected Hotel Finder search based on the criteria disclosed as bid amount + quality score. Early last week, Google updated the User Interface (UI) of Hotel Finder, and part of this upgrade included switching out the big red “Book Now” button which had a drop-down to view up to 5 OTA’s showing pricing + the owners site (without pricing) for all hotels. Since the update, the big red button is reserved for one OTA (or participating hotel) and there is a “More” button with drop-down containing the remaining OTA’s and owner site. These new features will mean a significant change for hotels that don’t yet know there IS a way to compete alongside the OTA’s on this highly visible new distribution channel. See blog post here for more information on Google’s updates to Hotel Finder. Many articles written (some listed below) on the subject of the new Hotel Finder Promoted Hotels ads wrongly assume that Google allows only the OTA’s and “large hotel chains” to participate in this channel. If you’re reading this article, chances are that you’re looking for a way to get your hotel listed, and now have the information on a technology provider with the ability to get your direct hotel’s rates and inventory loaded on this exciting new channel. Seekda, our technology partner, has been pushing rates and inventory for European hotels to Google’s Hotel Price Ads platform since early Fall 2011. Jenny Mendoza, Sr. VP of Strategic Development for Woodcrick-Seekda said, “giving Independent hotels the ability to show their prices on Google’s Hotel Finder and other Google Hotel Price Ads products is critical in order to compete on a level playing field with OTA’s bidding for the hotel’s name on the World’s largest search engine.” Mendoza, a past Director of Sales & Revenue Management for numerous independent hotels said, “Users typically will only click on links showing real-time prices and availability, therefore hotels that do not have their direct rates shown are missing out on a great opportunity to capture more direct bookings by driving users to their own site”, adding, “most Independent hotels don’t have a huge online marketing budget and can’t go head-to-head with OTA’s in a regular search, but with Google Hotel Price Ads and our technology partner Seekda, we’re able to offer the connection for a low CPC. If you weigh this CPC amount against what a hotel pays to a large OTA for each booking, the hotel could save upwards of 15-20%, potentially more per booking”.